3 rd Grade: It s Recorder Time! Summer Reading Welcome to 3 rd Grade!  Students go on a scavenger hunt to each section of the library and identify when and why each section would be useful. How can the library staff assist me? What is the DDS? How are books arranged in the DDS? How does the DDS help me find books? How can I use the DDS to find books? How can I compare and contrast how resources are arranged in the collections? ESSENTIAL QUESTIONS How do I use call numbers to locate resources? LESSON IDEAS, TOPICS AND RESOURCES  Call Number Hunt – Students are given a call number and must find the resource. NOTE: Lessons in the Inquiry Process Focus Area often address multiple standards and multiple steps in the Big6 research process. The lessons are listed by their curricular connection or subject area. What is the question I need to answer in order to solve the information problem? ESSENTIAL QUESTIONS What information do I need to solve the information problem? What type(s) of information (anecdotes, charts, illustrations, text, statistics, etc.) do I need to solve the information problem? How much information do I need to solve the information problem? What does this assignment require me to do? What are the best resources to solve the information problem? How do I know that the resources I’ve chosen answer the information problem? How do I know that the resources I’ve chosen are current? How do I know that the resources come from a reliable source and author? What tool can I use to locate library materials? Newsbank project – What is everyone celebrating? What print reference resources can help me solve the information problem? Where can I find these resources? What online resources can help me solve the information problem? What search strategy do I use to locate online resources? What features of the selected resource can I use to find information about the information problem? How do I interact with information in the resource based on formulated questions? ESSENTIAL QUESTIONS What information from each resource helps solve the information problem? How am I going to record the information so it will make sense to me later? How do I organize the collected information? What format do I use to present the solution to the problem? How do I incorporate the gathered information into the final product? How well did I solve the information problem? How well do my peers think that I solved the problem? What did I do well in solving the problem? What could I do better? What might I do differently to improve my problem solving skills? Why do I like or dislike this book? How can I tell one genre from another? What do the works of a particular author/illustrator have in common? (i.e. themes, plot, characters, artistic style and medium) What is unique in a work by a particular author/illustrator? What are some of the awards given to children’s literature? Why do some books win awards? What reading opportunities and programs are available at my library? What behaviors are expected in the library? How am I expected to care for library materials and equipment? How do I show responsibility in finding and using information? How will I follow the school and county rules for computer use? Below is a database brochure that you can distribute to all of your students. Included in the brochure is a description of the databases, as well as the passwords for at-home use. Before printing, please update it with your school’s information, as well as your school’s personal passwords for PebbleGo and EBSCO. generally not necessary within the school network, they are necessary when accessing from outside the school network. The OPAC can be searched by keyword, author, title or subject. KEYWORD searching is best used when only a part of the title or subject is recalled. AUTHOR searching is accomplished by entering the author’s last name, then first name. A TITLE search is great when an exact title is available. SUBJECT searching allows the user to develop a bibliography of titles on a particular subject. dictionaries, atlases, almanacs and newspapers. Library Media Library Media Standards Curricular (Legend: I= Introduction A= Application R= Refinement) Focus Areas I. Library A. Physical Setting and Library Services Environment 1. Differentiate among the collections of the library and the resources each contains How do I find information I want or need in the library? II. Inquiry Process – How and where do I find answers to solve my information problem? III. A. Literary Appreciation 1. Analyze a variety of literature for enjoyment Literature Appreciation 2. 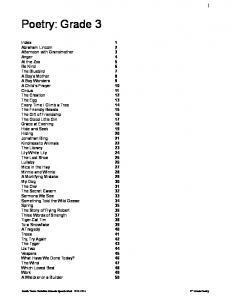 Differentiate among genres of fiction How do I evaluate what I read? B. Ethical Behavior How do I show that I am a responsible citizen? I. Library A. Physical Setting and Library Services Environment 1. Differentiate among the collections of the library and the resources each contains How do I 2. Explain services provided by library personnel find B. Library Media Center Classification System information 1. Use the Dewey Decimal System I want or 2. Distinguish among the classification systems for each collection need in the 3. Use call numbers to locate resources library? How and where do I find answers to solve my information problem? III. A. Literary Appreciation 1. Analyze a variety of literature for enjoyment Literature 2. Differentiate among genres of fiction Appreciation How do I evaluate what I read? IV. Citizenship/ Ethical Behavior How do I show that I am a responsible citizen? Appendix F – Bibliography AASL, Empowering Learners: Guidelines for School Library Media Programs. Chicago: American Association of School Librarians, 2009. AASL, Standards for the 21st-Century Learner in Action. Chicago: American Association of School Librarians, 2009. Assessment Activities from Learning, Teaching, & Innovative Technologies Center. Middle Tennessee State University. July 21, 2010 . Burnt Hills-Ballston Lake Library Media Department Library Media Skills Curriculum. September 2005 Burnt Hills-Ballston Lake Central Schools. July 21, 2010 . Elementary Library Media Curriculum Guide. Harford County Public Schools. July 21, 2010 . eWorkshop- Online Teaching Resource. 2005 Ontario Ministry of Education and TFO. July 21, 2010 . Library Media. 2006 Utah State Office of Education, Curriculum. July 21, 2010 . Library Media. Library Media Department of the Grosse Pointe Public School System. July 21, 2010 . Performance Level Descriptors~MSA~Assessments~School Improvement in Maryland. 2009 Maryland State Department of Education. July 21, 2010 . Summative Assessment Ideas. April 2010 Minneapolis Public Schools. July 21, 2010 . Report "3 rd Grade Library Curriculum"